KAFKA’S APE. Adapted and directed by Phala Ookeditse Phala. Performed by Tony Miyambo. The Alexander Theatre. 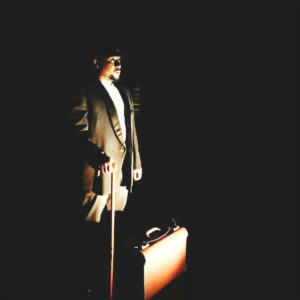 Kafka’s Ape is one of four shows from Joburg that have short runs here in Cape Town. It is so refreshing to get to see independent, fringe theatre from up country and it is a result of the successful partnership of The Alexander Bar in Cape Town and PopArt in Jo’burg that makes this possible. I had heard so much about this production that played to rave reviews at the National Arts Festival in Grahamstown last year, so I was excited to see it, and it was utterly, completely worth it. Cape Town, I’ll say this right up front. There are only three performances of this extraordinary work left, tonight, Friday and Saturday at 9pm, and the venue is tiny. Please go and see for yourself. The simple staging of this adaptation of Kafka’s Report to the Academy allows the incredible skills of performer Tony Miyambo and the deft touch of director Phala Ookeditse Phala to shine. Tony is riveting, moving and heart wrenching, as he expands on his journey from ape to man, and in so doing delivers the horrors of what being man is. His huge physical presence and control fill the tiny space, and the subtle emotion of his delivery are both mesmerising and absolutely haunting. Ape-like tics and sounds are sparingly and totally effectively used as well as dextrous and amazing swinging, leaping, and signing. There are few occasions where a single performer can tap into the deep emotion of storytelling and ideas to make the audience prickle with feeling and tears. Tony’s ape/man does that. This performance deserves full houses and long runs wherever it goes.